One of our most popular for bridal events. This Japanese Yukata was inspired by a lush garden of Japanese plum blossoms and graceful finch. The royal blue background highlights soft blossoms and finches on the trailing branches. Made in Japan of 100% cotton with a shrink resistant finish. 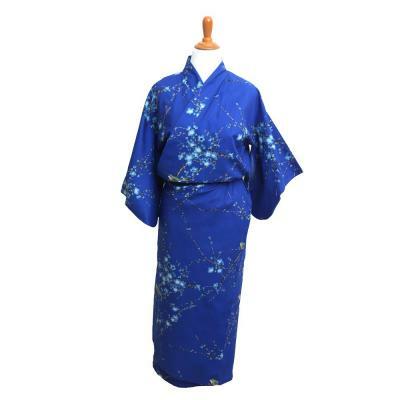 This yukata will become your favorite robe to lounge in. A matching belt is included. Large, measures 58" in length, and is designed to fit a woman 5' 7" to 5' 10" in height. The sleeve length is 13", the shoulder width is 24" and the girth is 46". If you are seeking a shorter length robe, seet our Happi Coats which are a shorter length version of the yukata. My bridesmaids wore these for my beach wedding. Everyone kept complimenting them on how beautiful they looked. Thank you for the quick shipping and help with sizing!